These are often called Skwala. The genus Skwala (Short-winged Springflies) of the Perlodidae family is represented by three species in North America, Skwala americana, the identical looking Skwala curvata and Skwala compacta. 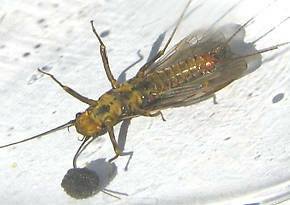 Skwala should be included in any comprehensive list of important stoneflies for the western flyfisher. Though often mistakenly thought of as members of the Perlidae (Golden Stones) that happen to hatch early, they are actually quite different and often far more important on many western rivers than their more publicized cousins. Perhaps the most significant factors regarding this growing recognition are their inhabiting tailwaters previously too warm for trout and the lengthening of trout seasons, both relatively recent phenomena. This explains the scant mention they have received (if any) in older angling literature. Excepting the lake dwelling compacta, they are lovers of cobble bottomed riffles and runs of larger mid to low elevation rivers. 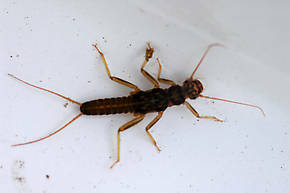 Their behavior is consistent with other large stoneflies except that they are more prone to floating long distances as they placidly oviposit, and with the exception of Pteronarcys californica (Salmon Flies) in some locations, they do it in larger numbers. There is usually no challenge to them for the fishes attention until Rhithrogena morrisoni (March Brown) mayflies begin to appear a few weeks later. Their flights occur during the warmest part of the day which usually means in the afternoon, though impressive flights have been observed around the lunch hour. Regardless, they finish well before dark. The river dwelling adults have smoky brown to brown wings, brown legs, and either primrose (often tinged w/ olive) abdomens ribbed with brown or the reverse in darker strains. The males are brachypterous (Brachypterous: With short or or addreviated wings. ), smaller and usually darker. Both sexes thoracic (Thorax: The thorax is the middle part of an insect's body, in between the abdomen and the head, and to which the legs and wings are attached.) ventrals are a curiously marked yellow/dark brown variegated pattern. Gravid females carry blackish pea shaped egg clusters off the tips of their abdomens that are much larger in diameter. Female Skwala curvata (Large Springfly) Stonefly Adult View 2 PicturesThis female dropped her eggs just before this photo was snapped. The distinctive notch in the subgenital plate identifies the species. An interesting observation is how active they get when exposed to direct sunlight. Trying to stage this specimen was most difficult. In the shade it would calm right down, but when exposed to direct sun it would immediately go nuts, scampering all over quickly without pause. Perhaps this explains why they don't seem to be found out and about on overcast days, but if the sun peeks out... She was 24 mm long, head to wingtip. Thoracic: The thorax is the middle part of an insect's body, in between the abdomen and the head, and to which the legs and wings are attached.